Fourteen Cambodian unions have launched a joint call for a Global Day of Action on December 10th, International Human Rights Day. 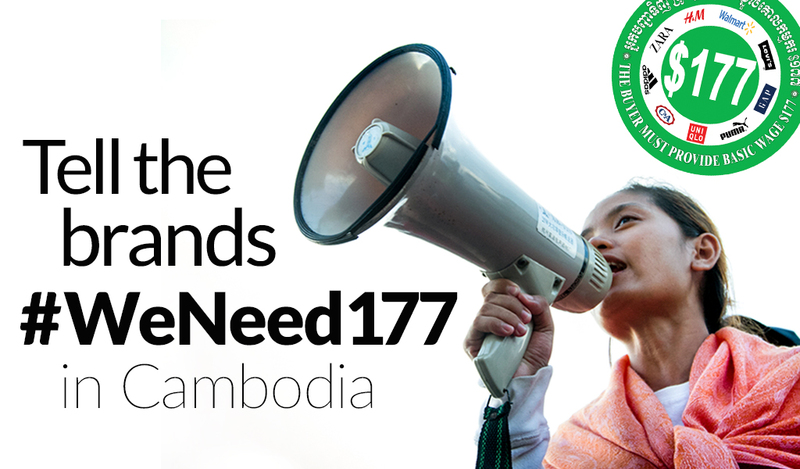 They are urging the government to adopt a new minimum wage of $177/month and they are asking for our support in calling on apparel brands and retailers to negotiate a legally-binding agreement with Cambodian unions and mandate a base wage of $177/month in their supplier factories, as a first step toward a living wage. While some brands that source from Cambodia have voiced support for the concept of a living wage, they haven’t taken meaningful action to ensure their suppliers pay decent wages. Now we are at a critical moment as the Cambodian government deliberates the new minimum wage. So if top brands are serious about ensuring workers’ health and decent wages, they need to act now. Please support Cambodian garment workers now by signing our petition to five of the top buyers from Cambodia: H&M, Gap, Walmart, Zara, and Levi’s. We’re very concerned to hear that garment workers who produce your clothes in Cambodia are still not paid a living wage. Make a commitment to renegotiate the terms of this agreement with Cambodian unions on a regular basis for the long term. We hope to hear a positive announcement from your company soon.